If you’re a bit overwhelmed by the sheer number of choices — really good choices — in the top-rated nuvi line, Garmin’s not about to make your decision any easier. The 2×5 series, including the 205, 205W, 255 and 255W adds so many features to the 200 series that the term "entry level" just might not cut it any more. In fact, the 205/205W and 255/255W incorporate both higher-end features as well as features not even seen in some of their higher-end siblings. The result is a product that is marketed as an entry-level system, but in fact has a solid mid-level feature set, earning the 2×5 series even stronger marks than the popular 200 series. Note that the nuvi 205W and 255W are wide-body versions of the nuvi 205 and 255 respectively, but are otherwise identical. The 2×5 series tucks numerous into the same sleek exterior of the 200 series, including a new and improved user interface for what we already considered the car GPS world’s simplest and most intuitive interface. Fortunately, the changes are truly enhancements, including the display of the posted speed limit for the road you’re traveling on (where available). While the 200 series did not provide traffic capability, even as an upgrade, the 2×5 series does, providing compatibility for both FM-TMC traffic and MSN Direct services, giving you a choice of services for real-time traffic monitoring. (Receivers sold separately and require a subscription.) MSN Direct provides traffic and weather updates, fuel prices, movie listings, local events info, and more. If saving money on gas is important to you, the MSN service provides both the ability to avoid traffic and find the least expensive fuel. The nuvi 2×5 series includes Garmin’s "Where Am I?" safety feature which helps you find the closest hospitals, police stations, fuel stations, nearest address and intersection. It also lets you see your exact latitude and longitude coordinates. Borrowing a feature from its top-of-the-line 800 series, the 2×5 series includes the ability to send addresses to your GPS directly from Google Maps or Mapquest. Simply find a restaurant or other location you want to visit on Google Maps or Mapquest and specify "send to GPS" and the location will automatically transfer to your GPS when connected to your computer. The 255 and 255W include text-to-speech capability which reads street names aloud, keeping your eyes on the road, not on the GPS. The 205 and 205W do not include text-to-speech. Garmin calls it "HotFix™". Geeks call it "Satellite Ephemeris Data Prediction." Whatever you decide to call it, you’ll find it to be another key enhancement found in the 2×5 series. With HotFix, your GPS remembers (for up to 3 days) the orbital position of all satellites it is tracking when you turn it off, predicting where they should be when you next power it up, dramatically reducing the time it takes your GPS to fix your position and start navigating. they should be the next time you turn it on. This gives the device an idea of where it should look for satellites, and dramatically decreases the time it takes for your Garmin to get its position and start navigating. No more long waits at the curb until the GPS is ready. The 2×5 series doubles the number of waypoints/favorites/locations you can store, from 500 to 1,000. It now uses a microSD card rather than a standard SD card. One change of note is that battery life has been shortened from 5 to 4 hours. We assume, however, that there is a plus side to this, namely a more powerful processer for faster route calculations. The downside of this speedier processer is that it has a greater thirst for electrons. The HotFix™ feature also drains a small amount of power while the unit is "off." Like the 200 series, the 2×5 series is sleeker, thinner and sports a more modern look, aided by the lack of a fold-out antenna, now an internal patch antenna. Still distinguishing the 200 and 2×5 series from mid- and high-end nuvis is the fact that none of the models include the ability to play MP3 files or provide Bluetooth capability for hands-free telephone operation. The nuvi 200 series, including the 255W, includes a vehicle power cable. We noticed that this had been omitted from the description above (“In the Box”) and have since made the correction. Sorry for any confusion and thanks for your question. …after returning two of the nuvi 750 models…which were more costly, and never locked in on a signal when I needed one, this 255w is great. If lag time in finding a signal counts, get this. I do not need extra bells and whistles (bluetooth, mp3, etc.) just need to get somewhere!! Maps are accurate, voice is understandable, and overall this is a better choice with substantial improvements! This site says the Garmin 260w is newer than the 255w, other sites say the 255w is the newer model. The 255w has a few more features and cost more than he 260w. Is the 260w just a newer model with fewer features? I used the 255W on a 6 hour business trip this weekend. It did the navigation job very well. We liked the posted speed limit on the map screen as well as the arrow showing our upcoming turns in the same map screen. These 2 features along with the text to speech feature are my favorites. My buddy who took the trip with me is fixing to buy him one in the near future also after seeing the benefits and saving gas. What about the nuvi 265WT? Why isn’t that model included in the review? How much memory is in the 200 series by Garmin for saved locations or previous locations visited? What is a Dashboard Disk? Does it stay on the dash board with Glue, Friction, or other? How do I get a copy of the insturctions for use or owners manual for our new nuvi 205W? I have the 255w and am going to be in Canada and am wondering does the 255w have maps for canada already to go, or do I have to buy maps? I just bought the 255W. Never had or used one of these things before, but I do geocaching using a Magellan Explorist 500 (hand-held). I found, too late, the Magellan wouldn’t work with a Mac. Contacting them, they indicated they would not be developing such software. There were other auto GPS receivers that looked about as good as the 255W, but, luckily in my searches, I found one review that mentioned this worked with a Mac. I bought it, have upgraded maps and the latest fixes, and am very happy with it. Reviews don’t seem to mention computer compatibility. I would not have bought my hand-held Magellan if I had known I could not use it to upload information. 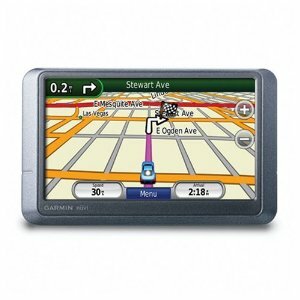 Glenn Rogers: go to the Garmin web site for the manuals and downloads. I did this and also downloaded a map (I was given a month to do this). This might have been an upgrade from the installed map. Also there may have been some firmware update. From now on I don’t know what is going to be free and what will have a cost. Dawn: the map I chose included Canada. There are several choices. To do this you need a UBS cable with the same kind of connector (to the receiver) as most cameras use to upload your pictures to a computer.